Fendt uses the latest technologies to set benchmarks in its production. New generation processing centres and high-tech CNC machines, including laser cutting machines, are used in these processes. With the most up-to-date paint shop system worldwide for tractor body painting, Fendt sets new milestones in the agricultural technology industry. All our workstations and processes are cutting edge. Customer focus is part and parcel of production and assembly. 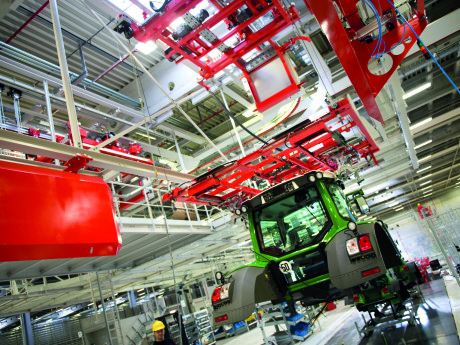 At Fendt, high-tech creates high-tech. An important advantage at Fendt is the concentration and bundling of all expertise. At the Bavarian location in Marktoberdorf in the Allgäu region, all corporate areas work together towards a common goal. For example, Development and Production are tightly meshed and work in constant coordination to position themselves for the future trends of the agricultural industry. Sales and Marketing are preparing for international growth. 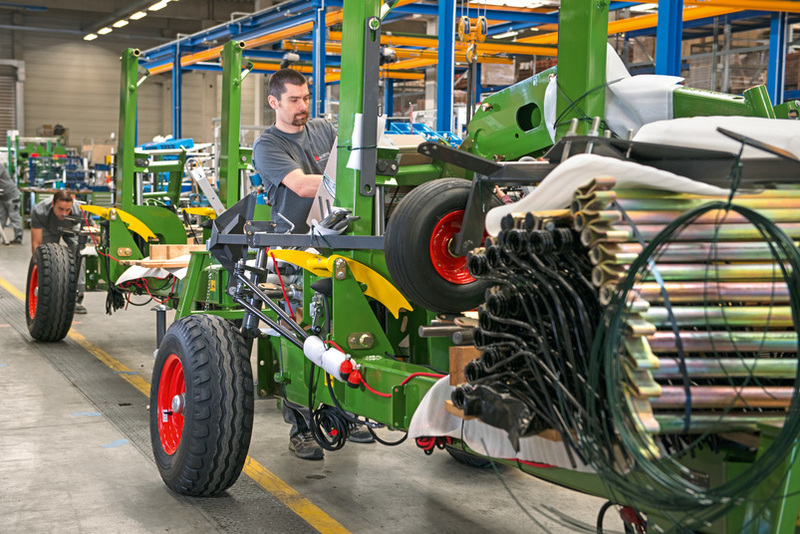 All tractors are developed, produced and marketed in Marktoberdorf. The workplaces and sequences must be designed for the highest possible ergonomics and efficiency. Tools and materials are clearly-arranged and intelligently designed and are set up by the assembly line, so workers have everything at hand, immediately and according to the requirements of the planned work. Structure, order and absolute cleanliness characterise the philosophy of the entire production facilities. The automated small parts storage system (ASRS) enables a high storage density and extremely short access times for the defined standard containers. 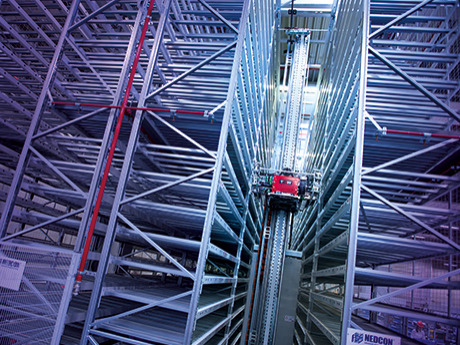 Very effective automation: more than 26,800 storage spaces are available for mini-load carriers on only 400 sqm with eight meter high shelves. The throughput of both shelving machines lies at an average of 125 storage and retrieval procedures per hour, performance that would otherwise require high manpower resources. 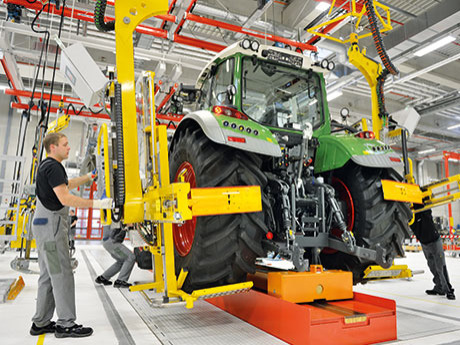 The Fendt cabs are assembled just-in-sequence in the new assembly hall at the Asbach-Bäumenheim site and are delivered directly into the assembly process in Marktoberdorf. After unloading the truck, the cabs are put on the materials handling equipment. The overhead conveyor automatically brings the cab into position over the appropriate tractor body and lowers it precisely into place. In Asbach-Bäumenheim, production begins with the delivery of raw material to the factory in the form of tubes, profiles and sheets of metal. Within the single piece production system, state-of-the-art technology and high-tech systems, such as flatbed or 5-axis lasers, form the basis for exceptional quality and unique design. The components for the cab and hood are already worked very precisely in the first step. Here complex contours are cut out of raw material plates using a 2D laser cutting system. The distinctive and unique form of the Fendt tractors, which is primarily defined by the cab and hood, is achieved with 3D cutting in ultra-modern laser centers. The technology in both the 2D and 3D cutting systems guarantees meticulous processing of the components. 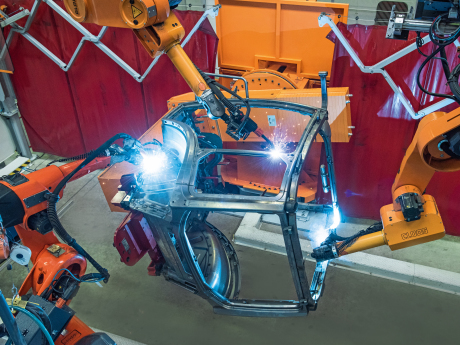 State-of-the-art welding technologies and processes are used, for example, innovative welding robots. 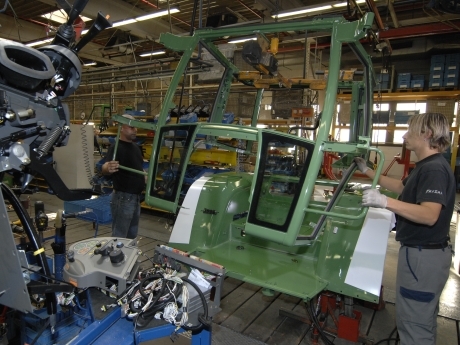 Using these modern methods, Fendt can produce unique cabs, such as the VisioPlus cab with the curved front window for the new 500 and 700 Vario series. The hood parts are glued and fitted together fully automatically in a processing cell in the modern robot hood facility. Automation guarantees the perfect quality for each individual hood. The Breganze factory is the home of the AGCO European Harvesting Operations, the centre of excellence for AGCO Harvesting. Over five decades of experience in building self-propelled combine harvesters Modernisation and expansion of capacity for sustainable growth Latest production processes and machines for continually high quality and productivity. The high-power combine, the Fendt IDEAL, and Fendt's 6 shaker models are produced at our site in Breganze, Italy, and distributed throughout Europe from here. This ultra modern plant spans 62 acres and has a headcount of around 610. The combines are manufactured in the Breganze factory according to the latest production standards by a dedicated team and meet the highest demands on quality. 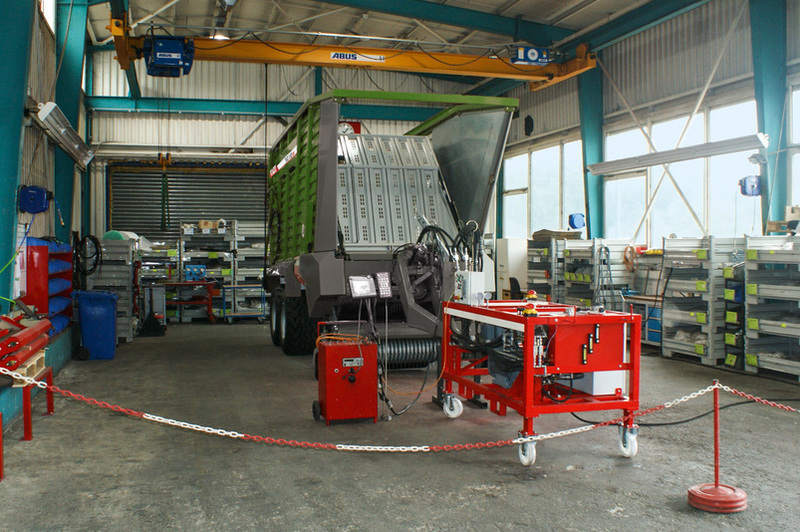 Visiting the plant in Breganze offers you a number of unique opportunities: being welcomed in the brand AgriDome visitor centre, seeing first-hand a cutting-edge manufacturing system, touching and experiencing the most advanced harvesting mechanization technologies. This is where our tracked tractors and tracked drives are developed and built for harvesting machines. Jackson uses Smart Glasses to bring quality and innovations to the fore. This portable computer shaped like of a pair of glasses allows employees in Assembly and Quality Assurance to view work instructions and use structured checklists. Experienced staff perform each work step faster and to a higher standard. The large AGCO/Fendt site with a generous 42 hectares of land in Hohenmölsen, Saxony-Anhalt. The location therefore has plenty of space for the series production of the first forage harvester in the AGCO Group – the Fendt Katana 65. 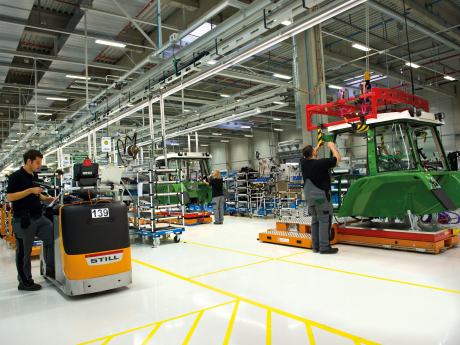 Furthermore, heavy plate components for the Fendt tractors are manufactured here with modern machining centres and delivered to the main factory in Marktoberdorf every day. But that's not all. The Rogator 300 and 600 sprayers are also given life here. More than 220 people are employed in Hohenmölsen. 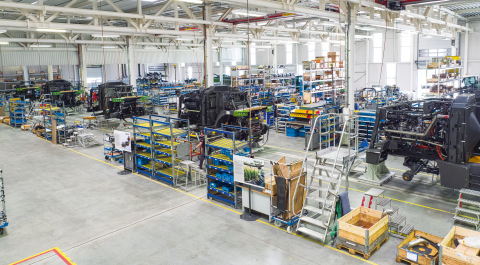 The ultra modern production hall meets all demands for technological progress and offers ideal working conditions for the assembly of the Fendt Katana 65. 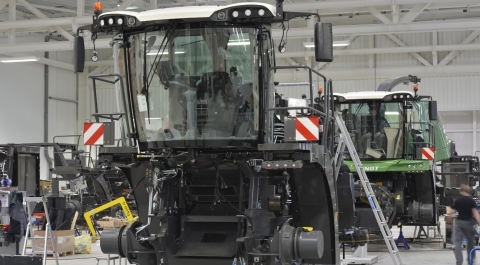 Highly dedicated employees in assembly, logistics and quality assurance have successfully mastered the challenges of the first series production of 30 Fendt forage harvesters in 2012. Processes and sequences within the production have been specially fitted for the requirements of forage harvester production according to lean principles ensure the production of one forage harvester per work day. evidence of the innovation drive. Location Hesston - Our centre of excellence for big balers and crop technology. With more than 30 years' experience, Hesston builds big balers of the highest quality. With its new approx. 18,850 m2 painting and finishing facility, this site sets new benchmarks in the agricultural machinery sector. With electrical coating (E-Coat), and powder coating, we adopted processes that gives every part a thorough, even and long-lasting finish. This is where the Slicer and Cutter mowers, the Former hay rake and the Twister tedder are developed and produced. 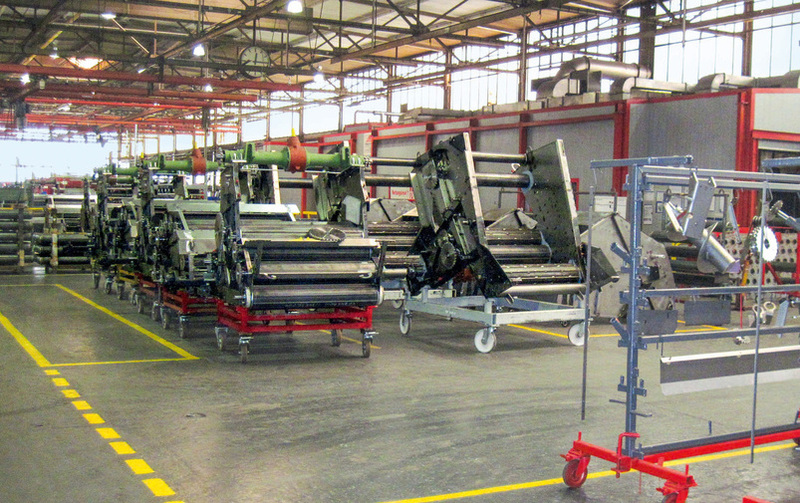 With the innovative use of lean management, the machine assembly results in low stocks and short lead times. Each Fendt Tigo forage wagon is specially produced according to customer requirements. All machines undergo 100% functional and finish testing. The finishing touch is applied in the finish and painting department. Ending with a perfectly painted premium forage wagon rolling out of the plant.